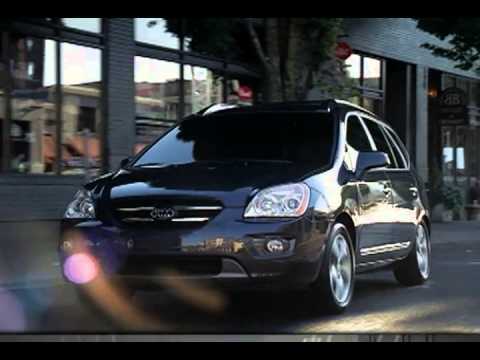 Matching versatility, value, safety and security, the 2008 Kia Rondo is a decidedly attractive choice for anyone in a one-vehicle household. The top-line EX, particularly when upgraded with the optional Leather and Premium Packages, makes a very inviting daily driver. Love my Kia. It is a great little car for a retired teacher. My Kia has been a great car. I have driven it across the country twice. It has been very reliable. I take good care of it. I bought it used and it has served me well. It is red in color, and unfortunately the touch-up paint Kia gave me on 2 occasions does not match it. I recently had the beige seats cleaned at the car wash and it improved the look well. I get good gas mileage, and use it mostly for in-town travel. It holds 5 people well, but I can lay down the back seats and it can carry very large items in the back portion. I would buy another Kia if I needed another car. This car has been paid for when I bought it. I was hit once from behind and the repair went well. I have only had one accident in my 60 years of driving, but I hit another car in the parking lot of walmart. It was repaired well, and you'd never know I have had it repaired. I could say more about this car, but that is all I can think of. Love my little red Kia. The best "big" little car I have owned. My favorite feature on this vehicle is the ability to seat 7 if I need it. If not needed it has an awesome cargo area. I have even put down the middle row of seats for a completely flat, very large cargo area. I love the sunroof and the sound system is really great, with a factory installed amp. It has seat heaters, as well. The 6 cylinder engine has great pick up. The only thing I do not like about this car is that the windows are not shaded. I have never seen this model car with shaded windows. I really hate that people can see right into my car in the back. All in all if you do not already own a Kia rondo please do not buy 1. It is a horrible vehicle. Too many internal motor problems. Not enough room in interior of the vehicle. Crammed and not comfy. Also vehicle sits to low to the ground. You can feel every bump in the road. Horrible suspension, undercarriage is rotted out. Due to the low sitting to the ground car. Should never own a Kia rondo if you plan on living in a cold, snowy environment. On the plus side of things, it does get really good gas mileage. Also the trunk space is very roomy. The Kia rondo looks like a small minivan. It is a very peculiar looking vehicle. KIA IS RECALLING 6,680 MY 2008-2009 RONDO LX AND EX VEHICLES EQUIPPED WITH A 2.4 LITER ENGINE. THE FUEL PUMP MAY NOT OPERATE PROPERLY RESULTING IN NOT ENOUGH FUEL GETTING TO THE ENGINE. POOR ENGINE STARTING, ENGINE HESITATION, AND OTHER IMPAIRMENT MAY RESULT, AND THE CHECK ENGINE LIGHT MAY ILLUMINATE. UNUSUALLY SEVERE IMPAIRMENT WHILE DRIVING COULD EXPOSE THE DRIVER TO THE RISK OF A CRASH. DEALERS WILL REPLACE THE FUEL PUMP SUB-ASSEMBLY WITH AN IMPROVED PART. THE RECALL IS EXPECTED TO BEGIN ON OR BEFORE SEPTEMBER 16, 2008. OWNERS MAY CONTACT KIA AT 1-800-333-4542.